The Best Western Inn at Blakeslee-Pocono is ideally located in the center of Blakeslee. Come and experience our hotel near the major tourist attractions. Best price guaranteed and exclusive deals. 100% Smoke free facility 2013 Winner of the Greatest Around the Poconos Award. 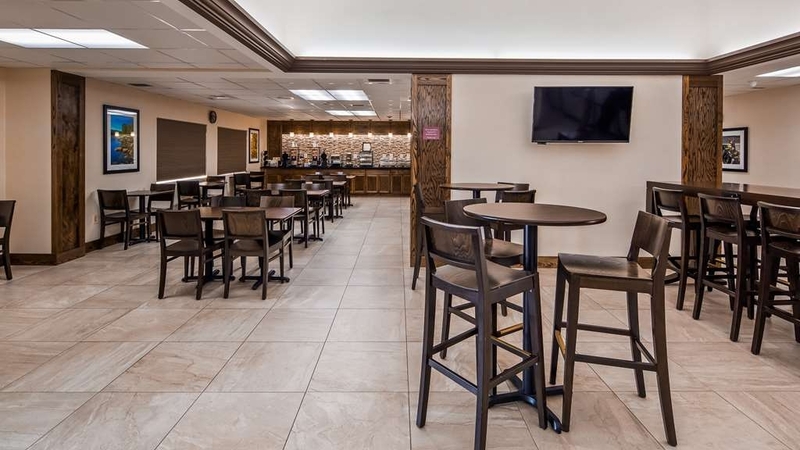 Our establishment sits right in the heart of the Pocono Mountains, a popular region among vacationers. Just two miles away is the famous Pocono Raceway, one of the most distinctive tracks on the NASCAR circuit thanks to its three-cornered design. 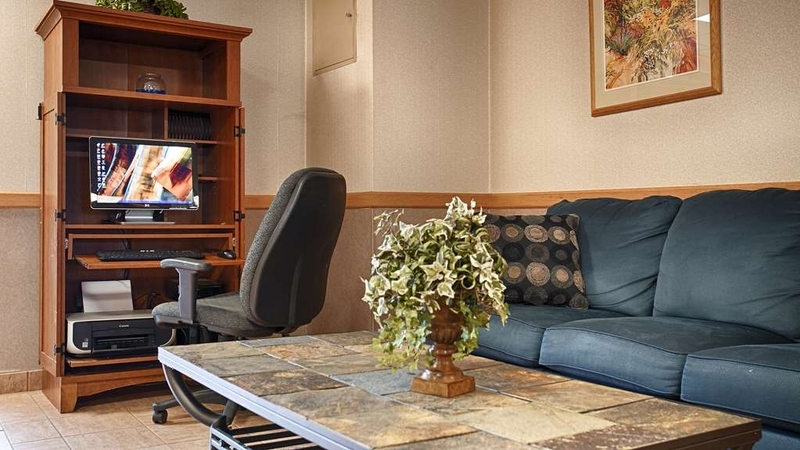 A stay at our hotel in Blakeslee makes it easy to attend the race and other nearby events. We're also popular among attendees of such events as Tough Mudder, Warrior Dash, Blues Festival, Beer Festival, the Mohegan Sun at Pocono Downs and more. The Poconos, of course, also offer a number of other mountain-based attractions. Skiing is among the most popular of these with our customers, thanks to the close-by locations of Jack Frost Big Boulder resort and Camelback Ski Resort. During the summer months, whitewater rafting is a great way to enjoy thrills amidst the natural beauty of our local landscape, or you can take in a little golf at Jack Frost International Golf Course. You can also find great shopping and dining options near our hotel in Blakeslee. Business travelers will appreciate the proximity to Tobyhanna Army Depot. 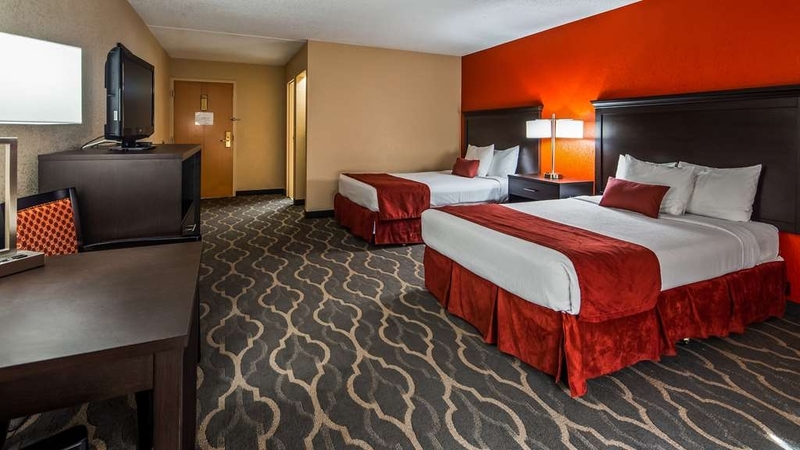 You will enjoy your time in your room, too, thanks to our hotels bevy of convenient and comforting amenities. 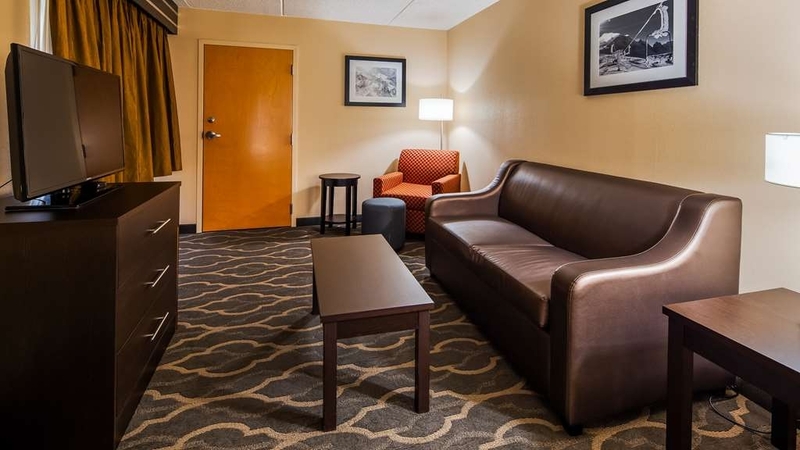 Each room features cable television with HBO® and free high-speed Internet access. Pet-friendly rooms are available by request. 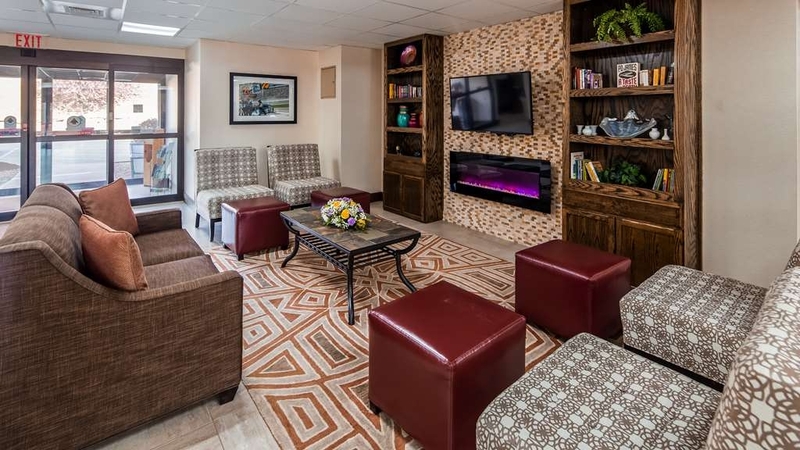 We also have some next-level amenities, like whirlpool bathtubs in some rooms for extra comfort and luxury, a sauna, and an indoor heated pool. 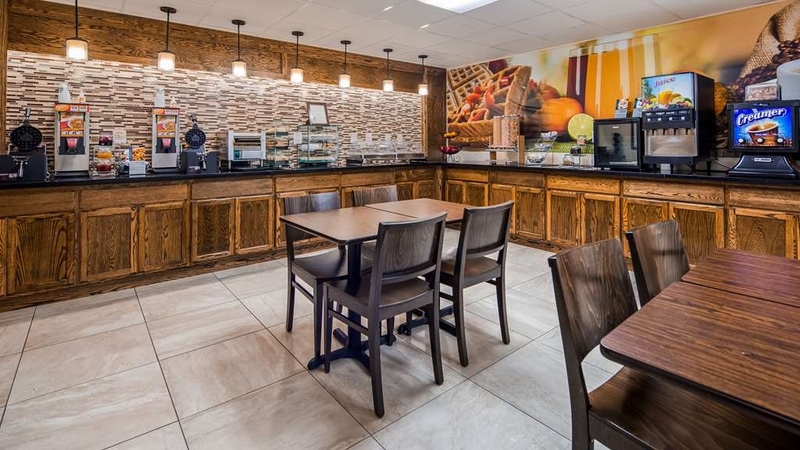 Lastly, don't forget to stop by the common area of our hotel each morning to enjoy our complimentary hot breakfast buffet. 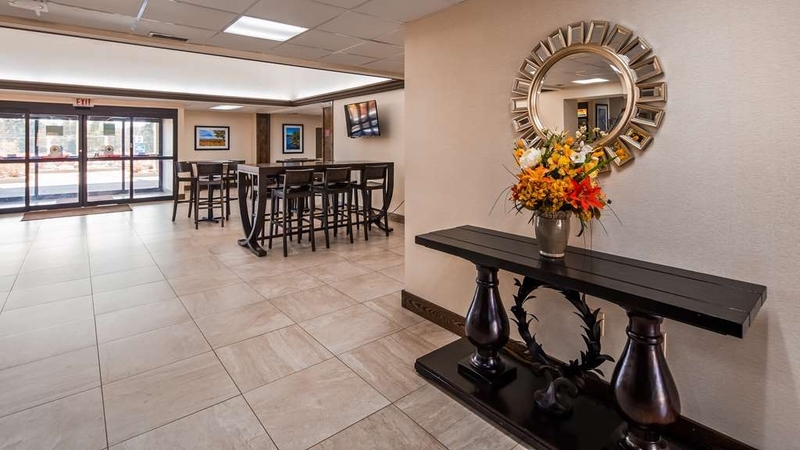 Book your visit to the Best Western® Inn at Blakeslee-Pocono today, and enjoy great service at a clean, friendly hotel in the Pocono Mountains. Enjoy your stay. The hotel was very clean, the front desk check in lady was very friendly. We checked out the pool area and sauna, both were clean and in good condition. Overall pretty nice stay, we had the king suite. The building looks new, feels comfortable with pleasant staff, clean surroundings with a good breakfast. The location is easy to find just off Interstate 80. Close to Pocono raceway. 30 miles from Delaware water gap national park. "Great place to stay in the Poconos." Great re-modeling job. Staff great. Price is right. In a great location. My only complaint is the new double beds. Beds are comfy but not very roomy for 2 grown adults. They need to go back to the queen size beds. Nice place and friendly staff. Rooms were standard, roomy, and clean. Breakfast was good but not fancy. Convenient to highway and Hickory Run state park. No complaints. Would stay here again when in the area. Very very nice place stopped here on way home it's clean quite seen lots working Saturday morning breakfast was plentiful with sweet lady helping anyone who needed it. I'd highly recommend. Area was clean nice common room. "A good hotel to stay"
Clean, neat, room has everything needed for a comfortable stay. Hotel administration is attentive to details, even tv remote was in presensitized pouch, how it should be and this is pleasant. There is also an iron in the room. Hotel is convenient to many local attractions. It is comfortable and clean. Only detractor is no fitness center. At the rates they charge there should be a fitness center. Nevertheless a good experience Clean , good staff, good breakfast . "Our go to hotel when in the area." This hotel makes a genuine effort to serve pet owners with well behaved dogs. It has become our stop when traveling to see family. The room is comfortable. The service staff is welcoming. 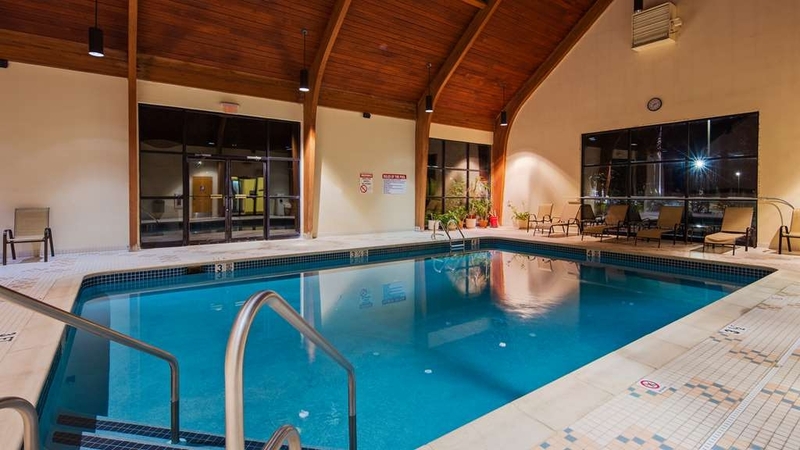 We also enjoy the pool and amenities. "Not worth what I paid"
I stayed at this hotel for 2 nights and cost me almost $400 for the two nights. It was not worth what I paid. Nothing stood out from any other chain hotel to pay those prices. The beds were hard as a rock and did not get a good night's sleep. My friends said the same thing who stayed here with me in their own rooms as well . "Hidden gem in the Poconos"
We travel to the Poconos quite a bit for the vistas, fresh air, nature and just to refresh. This is a hidden gem, nestled in the woods just off Rt 80 and Rt 115, you can neither see nor hear the highway. It is close enough to the area's attractions without being right in the middle of them. We like to relax with a Jacuzzi after a day of antiquing or sightseeing and their Jacuzzi suites are spacious, comfortable and very affordable (compare with other resorts in the area). Diane was so welcoming and helpful from our initial phone call through the check in process - thank you. We will definitely return and would recommend BW Blakeslee to everyone. "Mixed experience at this hotel"
We needed a place to spend a night in the Poconos with our dog and found this hotel. The staff was very nice, but the room left something to be desired. The bed sunk toward the middle, so much so that in the middle of the night that the sheet came off the bed. It turned out to be held up by wooden blocks in the middle. I'm sorry to hear about your experience with the mattress. We have just wrapped up major renovation to the entire building and will soon be replacing all of the mattresses, pillows, and bedding of the entire hotel. We hope that this news will help you consider visiting us another time so that we may exceed your expectations. "Great deal; nice breakfast & friendly staff"
After check in the fire alarm went off for several hours without stop. Not anyone's fault but still a big negative. The next morning the coffee maker in the breakfast area was not working. This caused me to go to the gas station for coffee that I was expecting to get included in the price of my stay. Lastly, on my second night while I was sleeping the sheet came off of the top of the mattress. I woke up with bites on both arms. I checked the mattress and found nothing but something did bite me during my sleep. The staff here is actually extremely friendly and helpful. I have no issues with the service at all. Unfortunately they could not resolve these concerns. My previous stay at this same hotel was excellent. "Good overnight spot near Camelback Ski Resort." My family and I stayed at the Best Western a few times over this past winters whole skiing Camelback. I recommend it over some of the other local hotels. It is cleaner, staff are friendly, the breakfast is very good, and overall value is better than most. The hotel was right where we wanted to be to do some hiking in the great natural areas around the hotel. The breakfast was great, the people were friendly. The only complaint would be the noisiness of other guests - which is NOT a reflection of the hotel itself. I have stayed here bwfore and will stay here again. "Best Western Inn At Blakeslee-Pocono"
This was a very nice hotel, the rooms were very clean, and there was a fairly good breakfast. The bed was nice and comfortable. Absolutely nothing at all to complain about. Would definitely stay there again. Love this hotel. We have stayed here many times and have always had a good experience. 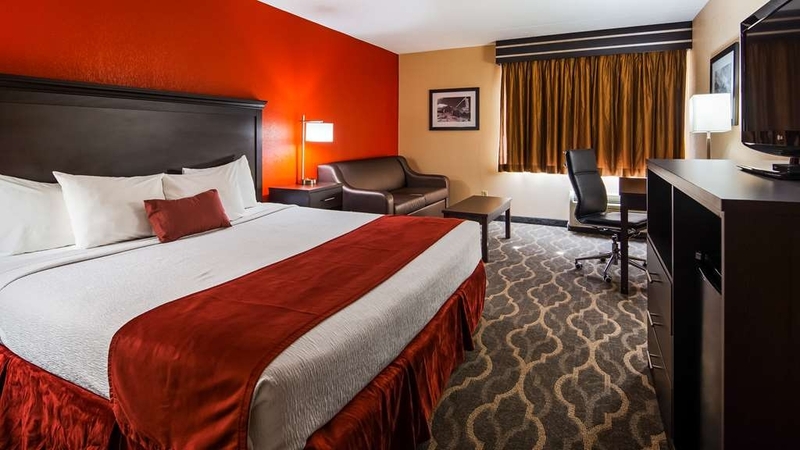 Staff is pleasant and knowledgeable about the hotel, Best Western rewards and the area. Looking forward to are next visit!! This hotel is clean, convenient, has a good breakfast, and the desk staff is excellent. It was quiet when we were there but it also was not very full. The rooms are being renovated and we had a room that had already been done. They could use some new pillows and mattresses. I was very disappointed that there were no protectors over the mattress, but the mattress was clean. On another note, as someone who smokes there is not even a bench out front for you to sit. Something I think all the hotels need to add. We are paying the same amount as other people and are forced to go outside. I don't have a problem with that, but the least they could do is provide a bench, the most they could do is provide someplace out of the wind. Great staff Great location Great all around. We have found this hotel to be great. Perfect location for a stop on our way to visit family. Staff is always pleasant and more then helpful. The lights of the hotel are a welcome sight. A good place to relax and retire. "Good, dog-friendly hotel, convenient location"
We recently stayed for a couple of nights' break with our dog and chose the hotel because it was pet-friendly, reasonably priced and conveniently located to explore the Poconos, right near the I-80. The staff were very pleasant and helpful, breakfast was good and the room was comfortable. The only downside was that the carpet in our room was in need of cleaning but overall we were more than happy with our stay. Overall stay was excellent! Staff was very polite. Full breakfast was also an excellent option. My 10yr old misses the homemade waffles lol. Indoor pool was a plus. Noticed after stay and allergies started bothering me that it was accessible to pets so that was a little uncomfortable with having no allergies mess on hand. "Average hotel with above average price"
Average hotel with above average price. Could have gotten a better value at nearby hotels. Chick in was not a great experience (won't mention what happened in this forum), but overall experience wasn't bad at the hotel. Clean hotel. No gym room but the area is great for walking and jogging. I am a repeat guest at the Blakeslee, Pa BW. My corgi and I love to stay there. The staff is excellent and very friendly. There are no other quality hotels in the Pocono region that take pets. I will keep going there as long as I go to the Poconos on vacation. Motel was overall satisfactory. We had a pet traveling with us and the staff was very helpful in placing us in a room that was close to back exit which made it easy to take her for a walk at any time she needed. Breakfast was okay, but I have had better selections at another Best Western. Donuts were frozen and then thawed. Room was clean and had not pet odor. All in all, we enjoyed our stay! "A great weekend trip to the Poconos"
Very clean and comfortable with courteous, helpful staff. Check-in and check-out was very easy along with a good value for the accommodations provided. I would absolutely stay at this Best Western on my next trip to the Blakeslee area. "Great location for enjoying the area with our family"
We gathered family from Boston, Pittsburgh and NY to visit the Poconos over Columbus Weekend this year. We had three rooms at the Best Western and all of us enjoyed our stay. Our rooms were comfortable and the pool area kept the kids happy when we weren't outdoors. The staff, especially Diane Walsh at the front desk and Melissa in the breakfast room were especially friendly and welcoming. It is an excellent location if you like to hike through the beautiful Fall foliage and the challenging boulder field at Hickory Run. The small but spectacular Austin T. Blakeslee Preserve down the road from the hotel is a must-see. "Great location, and good quality"
We are in a group of ten families visiting during the Labor Day weekend. They were nice to allow us the use of the breakfast area during the day for our informal get together. We found the rooms to be clean and service prompt. They do have a nice swimming pool, but no Gym. We found that to be odd, and if they install a health center, I am sure many visitors will use it and will be happier. Their location is excellent, as it is just off the exit on I-80. Listen i dont know how anyone can stay here unless their room was super amazing and clean. We had a room on the 2nd floor which was not cleaned properly. The hotel seems really deserted i felt like i was in a horror movie waiting for darkness to approach. I am sorry if any gets offended but honestly this hotel needs to be remodeled and then reopen, it is so plain and bear. Even the stairs going to the second floor looks like a school stairway just bland no carpet, the floor is messy. Upon arrival the front desk girl was not enthusiastic or even cared we were there, i greeted her she ignored me and said what do you need and gave us our keys. Once we saw the room we stood there for a lil bit and decided to check out, i didnt even want my luggage touching anything. The couch and the bed was dirty i mean seriously guys, noone thought to change the linens. Go there at your own risk, if you have a great time and room then thats great but i would never ever stay here again. Dear Jina J, On behalf of our entire team, I would like to apologize for not exceeding your expectations. Your satisfaction is important to us and we will be using the feedback you gave us to implement improvements to ensure we offer a better experience for guests in the future. We are currently in the process of renovating the entire hotel. We just recently finished the exterior and the lobby and will begin the rooms shortly. On your next visit, we should have a brand new hotel for you and all our guests. I hope that you will consider staying with us again so that we can have another chance to provide you with a superior experience. We stopped here in mid-week during the summer and it was pleasantly quiet. We had a clean, spacious room where everything worked as it was supposed to. Breakfast was just okay. No restaurants nearby, although a large truck stop is being built cross the street. We'll stay here again. This place is about 16 miles from Camelbeack and Kalahari resorts. You can stay here and go there for fun activities. Our stay was great, the breakfast was more than enough to start your day. Staff was amazingly helpful. "Unexpected quality in rural Pennsylvania"
This facility is well taken care of...site, structure, interior finishes, pool/sauna. Staff is very pleasant, maintenance work exemplary, cost very reasonable, location wonderful for outdoor experiences/hobbies. Highly recommend for a chill-out stay. Polite professional friendly and courteous The location is perfect, the view is great, and the scenic part is amazing. We enjoyed ourselves a lot and are planning another trip soon as we had lots of fun. Great quality for low cost. The location is good. They just renovated the lobby area, including the breakfast area. The room was neat and clean. They use white spreads rather than the floral prints that never look good. They are in the process of renovating the rooms, so that should get even better. "Guard Dog watching @ breakfast"
If your want to stay in Blakeslee this is the only place. Newly remolded...lost of band-aids but looks nice. Our room was clean but just the basic's. Check in had issues with Priceline so will check to see if I was overcharged. During Breakfast hours there was a attendant that just stared you down with NO smile. She seemed bothered if someone need help or if something needed refilled. Also this was a 1st for me to see....A TIP jar for the watch dog ! "Definitely worth the money! Great stay." Easy to get to off the highway and back on again the next morning, plenty of parking, great staff, clean lobby and rooms. Coffee 24/7, morning continental breakfast, pool, snack area near the front desk for late night munchies. What more can you want for under $100 per night? Highly recommend! Our trip was booked through AAA's website which did not disclose it used Priceline as a 3rd party. Our reservation was received by the hotel but Priceline did not indicate it was prepaid. The end result being, charged twice for the room. Verene at the front desk was able to contact Priceline and get the verification needed and reversed the charge. The willingness to see this through was very much appreciated and I highly recommend a stay at this location. Aside from the excellent staff, the facility is well maintained, clean and quiet. As for AAA & Priceline, I will never use them again for any travel planning. I took a few days to relax and get away . I had the room with the a whirlpool it was heavenly, relaxing and watching television in private. The water in the pool was warmer than any pool I've ever been in at a hotel, it was great. The sauna was truly the best of the best, it got hot and stayed hot. If you like all of these things above this is the place to be. Despite other Best Westerns welcoming us and our two pets with open arms despite a pet upcharge, this location refused to honor our reservation with no indication of this policy at the time of reservation. Bev, I would appreciate it if you could email me what happened at the hotel. We are a pet-friendly hotel but we charge a small pet fee per pet. My email address is [email protected] if you could email me directly I would love to solve the issue. very nice place to stay. Wonderful staff. Nice pool and sauna. Breakfast area and reception area very inviting. rooms very clean, rugs outdated and could of used another blanket, but other than that a very nice hotel. Great location to all major roads and areas of interest for us. "Comfortable and very pet friendly"
The Hotel was very clean and comfortable. The lobby was inviting and nicely decorated with a homey feeling. The grounds were well kept and groomed. The room had no odors from previous occupants or pets. The staff was very friendly and helpful. Had a wonderful room with plenty of space - we were able to play cards with our friends and still feel comfortable. Breakfast was good with a large variety. Only problem was a busy pool and sauna. Not the hotels' fault at all. We stayed in 3 different hotels in this immediate area and this was the most updated but twice the price of the others The bed was very hard and uncomfortable. The room was updated and clean. I would stay here again with my family. We stayed at this hotel for a national dance competition being held at Splitrock. It was very close, indoor heated pool for the kids and lots of space to hand out with the team. The hotel is a Little outdated but it was fine for what we needed. It was okay for a short stay but we would not stay there longer than two days. There is no place within walking distance, so we had to drive to nearby restaurants. They really need to install a charging station for electric cars. Clean comfortable room convenient to Lake Harmony. A/C a bit noisy by other than that a good 2-night stay. We will likely stay here again next July for the same family visit to Lake Harmony. Hot n cold breakfast buffet was more than adequate. The room had mold growing on the bathroom wall. We notifed the front desk as soon as we noticed it, and nothing was done. The front desk told my wife that they would "notify maintenance", which there was no follow up on. I guarantee that didn't happen. Currently at the hotel, stayed in room 100 last night, first, don't stay in that room. It's next to the pool, so it's noisy, and other wall is parking lot and walls are thin so you hear every family leave. Second, went to take a shower this morning and found mold on ceiling. Picture attached below. Showed manager and she was like we will have maintenance look at it. For the amount we paid for this room I wouldn't expect mold. If I wanted that I could have paid fifty bucks and stayed down the road. Very disappointed and won't come back to this best Western. Hotel in convenient spot for purpose of trip. However hotel dated , rooms could have been cleaner and should have been attended to during our absenceStaffing may be an issue , but still . I have been to many hotels and never returned to a room without it being touched. The hotel in a good location to the Poconos Race way. The hotel was OK for a 1 night stay. The bed was hard and the chairs in the room were dirty and I would not site on them. The room was OK but they need to updated the beds and furniture or cleaned the furniture. The breakfast was OK but they had no meat to go with the eggs. This place was the worst hotel We've ever stayed in. The room smelled of stale cigarette smoke and dirty hair. There was actual blood on one of the pillows. The bedding was stained and had hair in it, the short and curly kind. We would've been better off sleeping outside. Sorry i'm being brutally honest here, but that was my experience, and I wouldn't want anyone else to have the same experience. We checked in for two days our first day was fine , the hotel is pretty basic but clean and pleasant . However day two was not fine. We left early that day returning about 2:30. Our room was nit cleaned, towels were not replaced , beds not made etc. I was told they would get to it. We were going to a wedding, dressed and left and didnt return until 11:pm to see the room was not attended to. I called the front desk. No answer. We complained the next morning but received alot of attitude from the GM who grudgingly took 10% iff the bill. I would have rather had a clean room and someone who understands that service is their business. "Pricey stay for condition of room"
Room furniture, carpet and drapes need to be replaced. 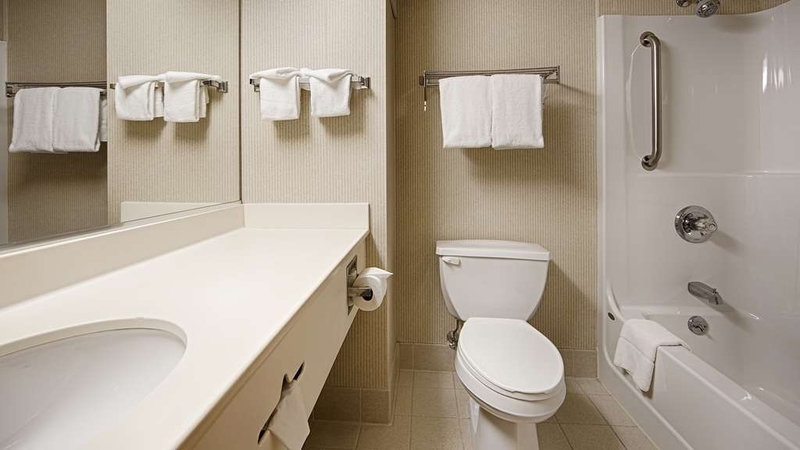 Hotel is located close to all major roadways for easy access to local attractions. There are motels nearby that cost less and offer a better value. "Nice enough hotel as long as you don't have to call them"
Had a bad experience on the telephone with the front desk, Upon arrival at the hotel, the GM informed me that she had never received a complaint about that individual, just short of outright calling me a liar. I can't support a business where the GM won't even try to appease the customer. Came to the area for a wedding and the invitation recommended this hotel for wedding guests. It was a very pleasant experience. Hotel is easy to find -right off the highway. However our GPS could not find the address. We ended up using my cell phone and google maps. Hotel staff were very friendly upon check in and during our stay. Room was spacious and clean. Loved that there was coffee available in the lobby at all times. Breakfast was full of different choices and items were replenished throughout. I definitely would stay here again. The stay at this hotel was very relaxing and comfortable. The staff from start to finish was friendly and nice. The receptionist was nice and pleasant. Every morning the receptionist asked how my night was and if my room was up to par. I was traveling for work. I wanted a hotel that was about Two hours from the city. I found this Best Western with a very good rate. I was not disapointed. The evening clerk was charming with a great food recommendation, Murphy's! Nice clean roon with a solid bed. The breakfast bar had a few surprises, walnuts and cranberries! If I was ever back in the area I would stay again. i will not return because of the the issues listed in the survey, I expect better quality than that. Breakfast could at least have meat on the menu. And really need to get rid of the smell in the whole building.In our room the curtains were ripped told the front and seemed like she didn't care. really a sad place. 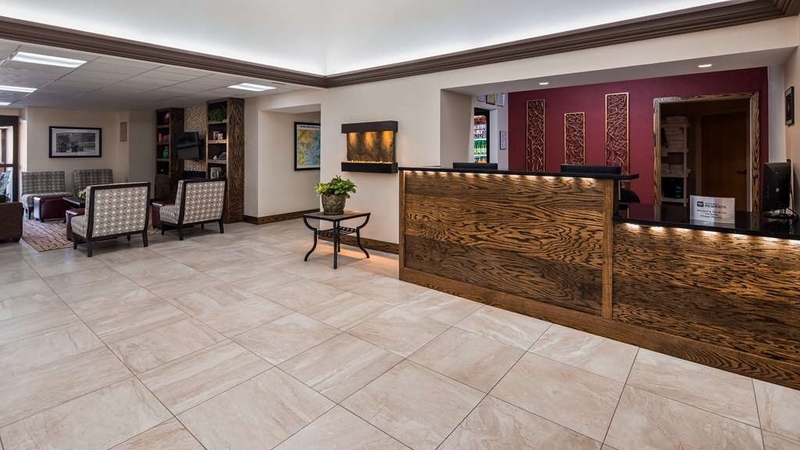 "Clean and updated with friendly staff"
Newly constructed lobby was beautiful and comfortable. The rooms and bathrooms also seemed to be updated. Very clean. Staff allowed us to checkout a little late as my husband was enjoying nearby fishing. I also watched a front desk clerk be amazingly professional while an aggravated, in-a-hurry guest was cursing at her for absolutely no reason other than his impatience! I was impressed! "Fit the needs of the trip"
First thing is the construction is done and the Breakfast area is back up and running and mentioned in previous reviews. The Front Desk staff and the Breakfast ladies could not have been any nicer..........Great Hospitality People!! Used the pool after a long day of being mostly on my feet and it was very warm and clean..........best part was at the time no kids splashing around. The rooms are average at best, we were on the first floor and did not hear any noise. We stayed three nights, I just couldn't get comfortable in the bed & never got into a deep sleep so I drove home on Sunday still tired. "Nice But Mattress desperatly need replacement"
Nice hotel overall and I understand that some renovations are being made. I inquired if the mattresses are being replaced; Not at this time. I am a normal size and weight person and felt the springs coming through. Could not sleep, so nice looking did not do me so well. Pool area was very nice and free breakfast was ok. Also,Please clean the pet hairs off the room couch. Not sure but they should have rooms that are Pet free. (no pets). Overnight stay while on our way to New Jersey. Thinking we would drive straight through to New Jersey we did not have a reservation when we decided we were too tired to continue on. Went on a web site looking for a hotel in the area we were in and Best Western was close and had available rooms so we stopped at 1AM and checked in. The only positives were the lobby that is currently being renovated and the AAA discount. I hope they have plans on complete renovation as the rooms are extremely worn and beds are not fit to sit on let alone sleep on. Had it not been so late and us not being exhausted I would have asked for $ return and gone elsewhere. Very unfriendly staff, awful breakfast in makeshift eating area. Stay away! I got a great deal and found out why when I got there. Lobby was under construction. A new counter and breakfast area were being installed. I will admit it didn't effect my stay. But hoping it will fix some of my issues. Breakfast was set up on 2ns floor though not a problem either. The quality of the food though was terrible. The person preparing the food didn't seem to care either. That said, let's hope the new area will resolve this. Nice pool with sauna. Needs new mattresses. They're a little saggy. I would stay there again though for the price I got or even a little more. "great staff a great place to stay"
One night stay here. Renovations were being done to the lobby area while I was there. Breakfast area was moved to the 2nd floor and the quality was OK. Room was comfortable and clean. No restaurants within walking distance. Staff was friendly and helpful. Please check before booking here if the renovations in the lobby have been completed. If you need a firm mattress you will want toconfirm that availability also prior to booking. I've stayed at many hotels ranging in price from 60/night to hundreds per night and the value I recieved for this hotel stay was approximately 60% of what I paid. This place is good for a night or two for a couple, family, or business trip. The beds were comfortable and the room was clean. We had our two dogs with us, so their pet friendly rooms were accommodating. The pool was small and pretty crowded. It was very warm, but had too much chlorine. 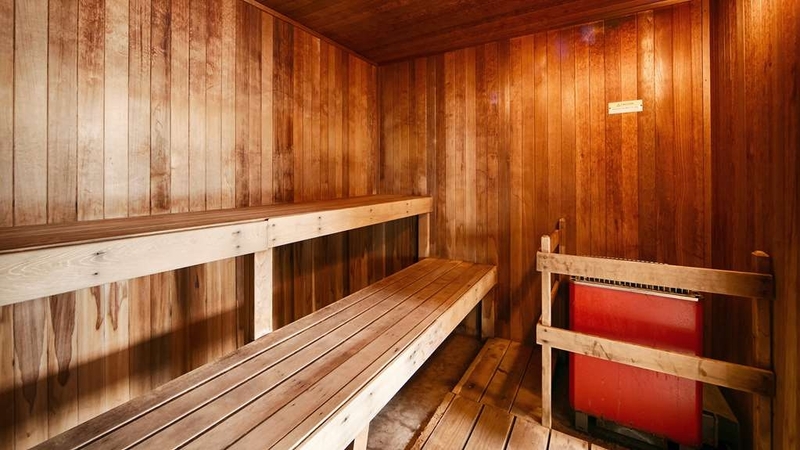 They also had a small sauna which was nice. Every morning they had breakfast which was included in the room price. Breakfast was ok. They had cereal, eggs, pancakes, fruit, and yogurt. The lobby was under construction, but there was no noise. Overall good hotel for the price. Some major construction was going on but improvised well. Nice staff. Good service. The breakfast was better than a more expensive hotel I stayed at in NYC. It's a good location, right along my route back home. "We made the best with our stay." Comfy beds and pillows...water pressure was great and hot water not a problem. When room was serviced for cleaning our drinking glasses and coffee were not replenished for the 4 nights we stayed. Lobby was under construction. (that wasn't a problem) nice to see they are renovating. Best Western is one of my favorite hotel for frequent visit. It's neat and clean. Also affordable. Their pool area is awesome. I love their hot tub. Whenever I go there, most of the time, I spend in hot tub. My children loves to swim. Most of the locations offers free hot Breakfast and coffee all day long for guest, which is great. "We Initially Thought the Hotel Was New!" The former reviews are correct in that they are remodeling the lobby area adding a new, larger breakfast area. This did not hinder our stay in any way. The construction workers were polite, quick to make sure we made our way safely around them and we were not disturbed in any way. We did not utilize the pool or hot tub area, so I can't speak to that. What I can say is this hotel is maintained the best of any we have ever stayed in. The paint was fresh, the carpets were new and we were shocked to find out the hotel had been there more than 20 years!! We really thought we were checking into a brand new hotel when we first got there. The room was clean, the bed was comfy with lots of pillows and the shower was good with lots of hot water. The staff were friendly, especially Betty, who was responsible for the breakfast area. It is currently in a small area, but she kept it well stocked with adequate fresh options for us and was absolutely delightful! I am a BW reward member and have used this chain nationwide. This was one of the better ones and if we are ever passing this way again, will certainly stay here again. Stayed at hotel first week in april. Lobby is under complete remodeling. Very loud noise due to construction work in hotel. They fail to specify that when booking a room online. Could bearly hear the staff talk to you due to all the noise. Couldnt access pool unless you walk the flights of stairs. Breakfast was horrible as well. No notification of being under construction on the website or in the hotel itself. Dust, Debris, wood and materials everywhere. The rooms, bedding and "whirlpool tub" were dingy, roughsheets and the bed was very "springy". The whirlpool had streaks throughout and black all around the water sections, we were NOT going to use that! The noise level in the hallway due to the room being next to the pool was never addressed nor other options provided. The staff was extremely indifferent and had a completely dismissive attitude and even said "its too late to find another room in the area for this kind of price"
My daughters, grandchildren and I stayed here the night before we were going to Kalahari water park. We wanted to turn our one night stay at Kalahari water park into a long weekend and since Kalahari is a lot more expensive than a hotel, we decided to just find a hotel a short distance away with a pool. the staff was very friendly, the rooms were pretty clean, though the beds were not the greatest. I really don't think hotel beds are all that great anyway, but these beds were a little less than average. They weren't horrible, they just weren't that great. They need to get rid of the double beds and put queen beds in the rooms. Overall though we really enjoyed the stay here. I would definitely recommend this hotel. I have stayed in many motels. This one has been the most friendly. The lobby was decorated for Christmas. The indoor pool was warm and very clean .Breakfast in the morning was very nice. It is located right off the interstate. "Nice for short stays and mini vacations"
Nice hotel and staff. Rooms are nice and clean, but can use updates for the ac and beds. Beds were a little small. The heating and AC was loud. Pool was a plus to have for the kids, and breakfast was decent. Just, the breakfast area was a little small for the guests. And items needed to be constantly refilled because it was running out. The staff was helpful and friendly. Also, the location is far from major shopping centers, but there was a supermarket and Wawa 5 minutes away for basics. "Weekend Stay for a Surprise 90th Birthday"
My family and I were very satisfied with our stay. This was our first time staying at a Best Western. We definitely stay again. The rooms were very clean,the beds were comfy. The breakfast was good. The coffee, tea and hot chocolate all night is also a great plus. The staff were very nice and helpful. I definitely recommend this place. "It a Best Western, we weren't expecting fancy." A decent stay. The beds were fine but mushy. The linens were nice, but did not stay on the bed. The breakfast made my 9 year old happy (Fruit Loops). The Wifi had just been updated, but everyone was saying the WiFi was not working. One of the staff was trying to reboot, but it didn't really help. The staff was very nice and willing to help. Overall acceptable except the Wifi. The pool was nice and warm on a cold night. Pretty good for a $75 hotel with breakfast for 3. They need to figure out a way to keep the cold air from the automatic doors out of the lobby and breakfast area. This hotel is very inexpensive so I didn't know what to expect. The entire facility is clean and neat inside and out. The front desk staff were among the most friendly I have ever met. The room was decent size and very clean with friendly maid service. Breakfast is about the same as everywhere, decent enough to fill up before getting on the road. Clean rooms and quite. Continental breakfast very basic but good. Very friendly staff. Good wifi and TV reception. Near alot of waterfalls in area. Short trip to Wilkes-Barre for lots of shopping and near outlet mall. Very nice stay. Best pizza Dominic's. my group stays here twice a year and we get 4 to 6 rooms at a time, the staff is great.The pool and sauna are always clean and the ladies at the desk are very good.Rooms are clean and the breakfast is also very good, coffee and juice are open 24 hrs. "It used to be quite nice; it has slipped"
The assortment and quality of the continental breakfast is poor. Room AC/heat units rattle like a broken down jalopy. We had 4 rooms; 3 were annoying. 75%. Internet connectivity is spotty, speed is laughable. 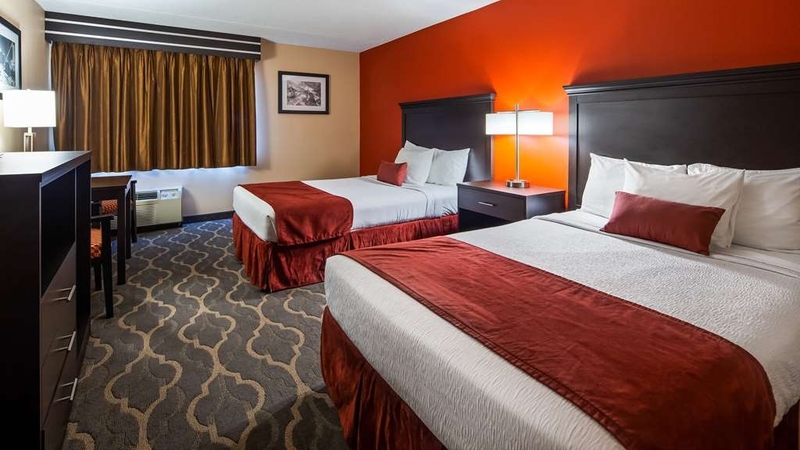 "Our room was not cleaned"
Our room was dirty and had an unpleasant odor. There were not enough electrical outlets. The breakfast was not appetizing. The food cold and stale. The pool looked like it had not been cleaned. The staff were nice but the hotel was kind of a dump. My family likes to go hiking, so we decided that we wanted somewhere close to Hickory Run State Park. This hotel was in the perfect spot for that and other cool places. It is right off I-80, so it is conveniently located in that regard as well. The outward appearance of the hotel was very nice, but what shocked us was the size of the room. For what we paid, it was very spacious. 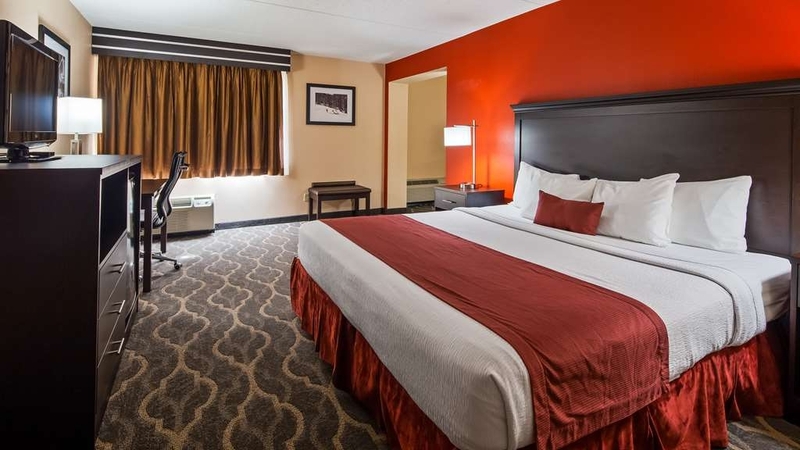 We use Best Western a lot for out travel needs because we know that we will get a certain amount of quality. We know that the rooms will be clean and breakfast provided. I have never had such a huge room in a Best Western before. We don't normally need a lot of space so it is not a priority - but it is definitely nice when you get it - especially for as inexpensive as this property is. The one letdown was the breakfast, which was even subpar for a regular continental breakfast. They did not have a waffle station, canned fruit instead of fresh apples and bananas, and heated up pre-prepared from frozen cheese omelettes. They had sausage gravy, but the second day they didn't even have any biscuits to go with them. They did have an indoor - though small - pool, which is always a bonus for my small children. Overall, I can usually overlook a less than stellar breakfast and look at all of the positives that this hotel has, We will definitely stay here again when we go hiking in the future. The hotel was very nice when we arrived and the front desk friendly. When we got to the room it was nice and clean but the sofa was full of holes. When we went to bed the linens had lots of holes and the sheets wouldn't even stay on the bed. The hotel staff was very nice. The carpet seemed very clean because we ran around in our socks and they weren't even dirty. We chose this hotel due to its pet friendly accommodations. I made several phone calls to the hotel prior to arrival. I wish I could remember the names of each person I spoke to, because each person was just so friendly. Nonna and a woman whose name began with a "V"... just so helpful. The rooms are what you would expect for the price. Not awful. Not good. I'd call them acceptable. Our room wasn't cleaned properly when we arrived, but it was just a few minor things. I will say that the dbl full rooms are quite spacious. Plenty of room if traveling with pets. Noise does travel so you will hear the surrounding rooms. Parking is frew and there is plenty of it. This hotel is quite easy to get to, about 30 min from anywhere you could want to go, and close to main roads. Due entirely to the staff, I'd happily stay here again. Hotel very clean, housekeeping staff does a great job. Nidhi Kalsa and her staff were courteous, kind and efficient, always ready to answer any questions. Room was average but very clean; new microwave and small refrigerator, too. Grounds kept immaculate; have separate area in which to walk your dog. Breakfast area kept clean and replenished. Everyone friendly and helpful; left my cell phone behind, called the hotel, they went up twice to the room to locate it. The phone and charger were waiting at the front desk when I returned a half hour later. Staff went above and beyond, as they did throughout our stay. My experience was very good. Was in town for a wedding and wanted a place clean and safe. Best Western fit both of my requirements. Would stay there again. Location was good for sightseeing. Staff was polite and helpful. Breakfast was ordinary. Hotel built approximately 12-15 years ago.Although the physical attributes of the hotel could use someupgrading,it is clean and wellrun.It is very convenient for traveling as it is very close to Route 80 and not far from Rtes 380 and 476 which are a short trip on Rte.80 Hotel staff are very courteous and knowledgeable of the different attractions in this area of the Poconos.There is also ample parking facilities. "Excellent staff, older but acceptable structure"
This hotel has a feeling (and slight smell) of having been around for a while. Most rooms (we were with a group) were just fine but one in particular was a bit musty and had an unclean bed cover. While this was immediately remedied, it did leave us wondering what other short-cuts might have been taken. Over all, for the price paid it was more than adequate. I booked online which was even cheaper than the group block discount or calling in a reservation. "Great services beyond expectations "
Their hotel staff is well trained in a professional manner and definitely possess a hospitality mind that would make a room, hallway, and swimming pool very clean. We stayed over a busy Labor Day weekend, and a pack of people showed up at the same time for free breakfast in the morning; however, a GM by herself helped their kitchen staff handle the situation. This is the "best" Best Western or a same kind we've ever stayed. Definitely we would like to come back to this hotel! You couldn't tell me this place didn't use to be an old hospital they turned into a motel. Smells like one too. Really need to update the furniture also. Felt like i walked into a motel in the early 90's or 80's. Also the room did not have a jacuzzi in it as the photo shows. "Best Hotel to stay at that is why it is called Best"
I just wish they did not make their promotion a limited time offer. Every Best Western we stay in is excellent. Although some should check the temperature on their pools. Blakelee pool temperature was perfect and it made us want to be in the pool longer. "Clean, pet friendly, good breakfast!" We have stayed her many times. It's always clean and welcoming. Good value and central location. Comfortable beds, friendly, helpful staff. Pet friendly hotel. Not a luxury hotel-good for family and travel. Nice pool. Our stay at the Best Western was much better then what I had expected. 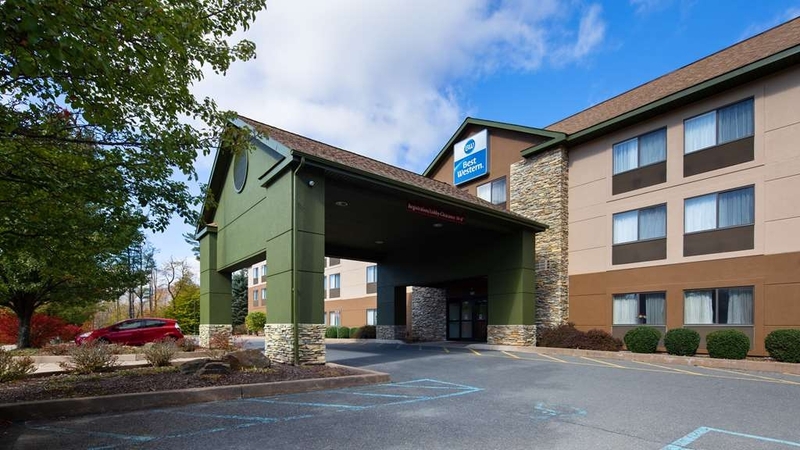 This was our first time staying a Best Western and we were glad we chose Blakeslee-Poconos. The staff was very cordial and helpful. The breakfast was sufficient. The accommodations were clean and comfortable. The only complaint we had, and it wasn't with the Best Western, as it was with the online registration. We chose this Best Western because of it's reasonable price, but after registering online we notice a service charge of $20.00 (non-refundable). Of all my travels across the country I have never seen this. I think Best Western should look into who they use to do their bookings. Plain, clean room. No frills. You get exactly what you paid for including breakfast. They is a pool on site as well that has later hours. No bar. The staff is polite and actually quite lovely. No early check ins prior to noon. Very close proximity to ski resort and Lehigh gorge. Access to the highway. Restaurants close by as well. Let's start with look for something else. For $135/night you can do better. I recommend the comfort in 7 mi from there. There's No mini fridge no microwave in your room. Yes, I'm serious. Pack a cooler. The bed in like sleeping on a cement slab. I would have been better off sleeping in my car. Pluses - it's clean, the pillows are great. Coffee and tea 24/7, a small heated pool. Landscaping is pretty - again maybe I should have slept outside. Priced to high for what your getting. I don't care if it's close to the raceway it means nothing to me. Would I stay there again? Not so much! "All the money is in the pool"
My initial impression of this hotel was positive. The room looked clean but I quickly noticed there was no fridge nor was there a microwave and my wife and I had Chinese food that we couldn't eat the next day because there was no way of keeping it cold or reheating it. Also, the wifi was kind of spotty and even more so when more and more guests arrived at the hotel into the weekend. Eventually it just stopped loading anything. Breakfast was small but can't complain about a free meal. The pool was by far the nicest area in the hotel which also included a sauna. This hotel needs a total makeover. Carpet and sofa in room had holes/tears. Mattress is worn out, sheets don't fit. The hallways had openings in walls covered by cardboard that was duct taped to wall. The staff does keep everything clean, and here attentive. "Hotel for Track Weekend at Pocono Raceway"
This was my second stay here while I was attending a car club driving event at the Pocono Raceway. The hotel is only three miles down the road from the racetrack and is also right off Route 80 and is easy to find. The hotel is clean and very comfortable. There are several gas stations just down Route 115 and a Wawa. I'll be staying here everytime I come to the track. Front desk staff need to go back to school on how to behave. Staff on duty during our stay had no sense on how to treat paying customers. Room was adequate, nothing special but is what you can expect for a Best Western. Although overpriced for the level of quality and service. "Best "Best Western" I ever stayed in." Beautiful setting, wonderful staff, very neat and clean everywhere, even stairwells. Also convenient to dining places, ski areas, Pocono Raceway, etc. I highly recommend staying at the Best Western-Pocono. "Average hotel, but strange policies"
We stayed here for a week with a team of girls and parents in April 2016. The hotel was exactly what I expected for a fairly inexpensive Best Western. Beds were decent, but not great, rooms were a good size and easily accommodated 4 people. The pool is great for the kids to swim. Breakfast was so so but again exactly what I have experienced in other similar hotels. Pastires, toast, premade eggs, cereal, coffee and juice. The strange part is on the housekeeping. The housekeeping here doesn't clean your room unless you ask. There is a sign (up high on top of the TV stand - which i can't read unless i brought it down) that you have to put on your bed for them to make it, otherwise, they just left the beds untouched. We didn't figure out what the 'sign' was for the bathroom. Unless we asked, the towels were not replaced or even picked up off the floor. The little shampoos were not replaced the whole week and apparently they housekeeping won't wipe the bathroom counters if there are any of your personal belongings on the counters. As a result ours was not cleaned all week as I'm not sure where you put your toiletries if you don't leave them on the counter.?? it was really strange. The housekeeping staff were very friendly and helpful when we asked, but I have never stayed in a hotel where you have to ask to have your room cleaned or that you have to put away everything. She also told us that if you leave anything on the bed they won't touch that either.... Last disappointment was the internet. I understand that the cell service in the area is poor (totally beyond the control of the hotel) but the wifi is terrible. it is weak and disconnects regularly. Even as I work in the lobby I am not confident this message will send as I am constantly being disconnected from the wifi. Overall it is a great location and a good hotel. Staff are friendly and price was good. Just very strange operational policies. "Best place to stay in the Poconos"
Had a great weekend stay at the Best Western inn at Blakeslee-Pocono. 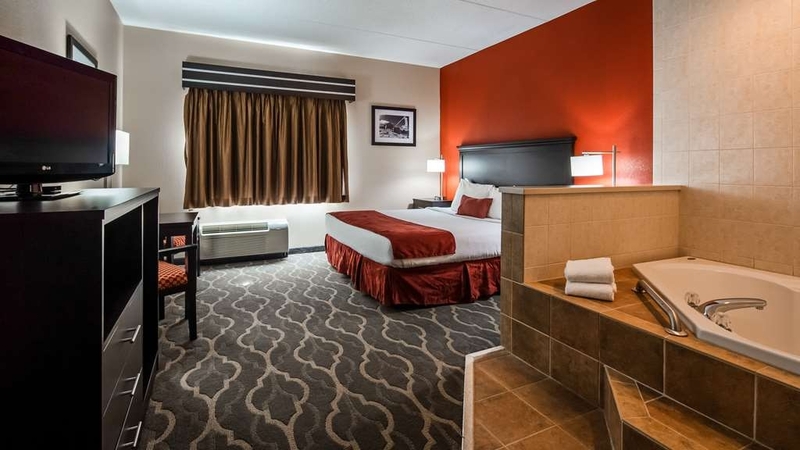 Comfy rooms and centrally locations to all Pocono attractions. Service and staff all made the stay enjoyable. Next trip to Poconos this will be my 1st choice in Hotels. Love this place, great staff.Rooms are great and the heated pool is very nice.Place is very clean and the out side looks nice, we bring a group and they keep all our rooms toghter.We always enjoy are stayand always go back for our trips to PA.
Great place. Really big free breakfast. 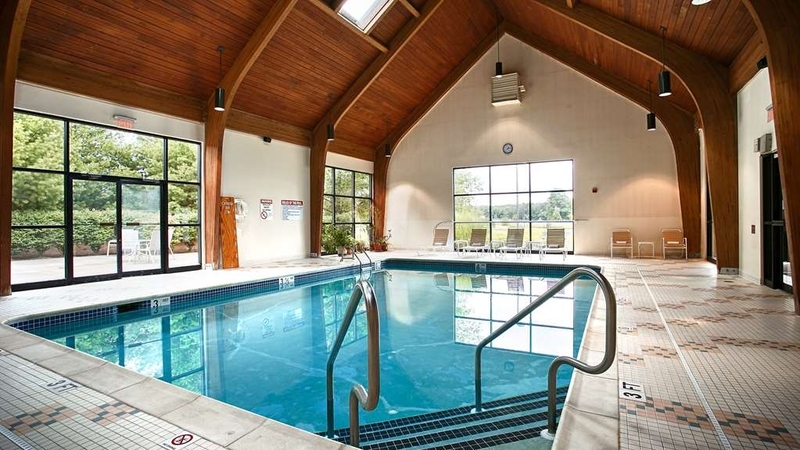 Heated floors in pool area and sauna. Rooms clean, and spacious. Only negative is that there was no fridge or microwave in room and the tub plug didn't work. Had small kids so shower wasn't an option. For the past 7 to 8 years my family and I have stayed at the Blakslee Pocono location to ski at Jack Frost. We have always found the hotel to be clean, the staff to be friendly helpful and professional and the breakfast which is included as part of the room rate adequate. We have never experienced a bad stay and plan to return for all future Ski Trips. "Try to find another spot"
Nice enough but the heater was very loud. I have to commend them for their honesty. I left an expensive watch in the room and discovered its' loss after an hour of driving away. I called - they went to look for it - found it - and held it for me until I returned to pick it up. I was very grateful. Location is good about half way between Jack Frost and Big Boulder ski resorts. Room is pretty basic and could use some updating. Staff at front desk seemed overwhelmed on president's day weekend. Hotel is ok for one night and room rates are reasonable. "Great Place to Stay with Your Furry Friend"
The hotel is pet priendly, that is a plus. Fiendly desk staff, particularly Verena. The link with hotels.com was misleading, though. Rooms did not have fridge as specified in the link. Hotel staff wanted to charge me for the fridge, but rescinded when link was checked. Kids in the group enjoyed the heated indoor pool. Hotel had buffet breakfast on Sunday morning when there were more guests. The following Monday morning, when the hotel guests were probably just us (8 of us), there was no buffet. Instead we were individually asked whether we liked this, that, etc. Good way to economize, but quite disappointing. Would sill stay in the hotel given the chance. This hotel has great places to eat nearby. The pool was clean and quiet, my room was comfortable. But when I went out on the town when I came back, my room was not clean. I think the cleaning staff missed cleaning my room. We find this hotel a great place to stay. It is easy on and off the highway. Quiet, set back from the road. We have even rode around the area and saw black bears in the woods, which we loved seeing! The staff is always helpful. They even gave us a 3:30 AM wake up call and check out last Christmas so we could get going to avoid a snowstorm. Great Staff!! Thank you for taking the time to write a review on your recent stay with us. I am happy you found our hotel convenient and you got the chance to watch the bear roaming around. We always look forward to seeing you when you are in town and hope to see you again soon. I've stayed before & had been satisfied, but the hotel changed. The room had a musty odor. The carpet was worn & not vacuumed. The bed was uncomfortably & bounced, the pillows were lumpy. The couch was stained & had rips.The towels were not white but a dull grey. Breakfast is free, but I don't expect stale bread, rubbery eggs & hockey puck sausages. "stay only if you must"
The hotel is clean and the staff very helpful but the mattresses and bedding are very poor quality and skip breakfast... the milk was sour and the food was gross. the eggs were tasteless, the coffee stale and don't get me started on the toast. The pool was clean and was a nice temperature. Thank you for taking the time to write a review on your recent stay with us. I am sorry you found our beds to be uncomfortable and the breakfast unsatisfactory. We value your opinion and will use your feedback to help us improve our service and facilities. We hope you give us an opportunity to be of better service to you in the future. Used hotel while attending family reunion. Ease of access to Rt. 80 was easy, parking was good, cleanliness was good. Breakfast on par with other chains and Wi-Fi worked great. Room was good and clean. Bathroom clean. Beds very comfortable and a good nights sleep. Television stations for kids was ample selection. Fireplace in lobby nice touch. Thank you for taking the time to submit a review on your recent stay at Best Western. I am glad you had a pleasant stay with us and found our location convenient. I have passed your favorable comments along to the housekeeping staff on the cleanliness of our rooms. We hope to see you again in the future. Thank you for taking the time to write a review on your recent stay at Best Western. I am pleased you enjoyed your stay with us and found the breakfast good as well as the rooms clean and the staff good & helpful. We look forward to seeing you again. After reading some of the other reviews I was very concerned about staying at this hotel. But I did stay at the hotel and was very happy that I did. I was going to Pocono Raceway and it is very convenient to that site. I was concerned about the hotel cleanliness and staff friendliness based upon some of the other reviews that I read. I cannot speak for others, but I was very satisfied with the cleanliness and the staff friendliness. I would not describe it as better than other hotels in which I've stayed but certainly on the same par. I did find it better than the "resort" that I stayed at last year in the same area. If I have one negative, it was that the walls must be thin since I heard noise from the room next door -- but that was not a serious problem since it was quiet by bedtime. I would like to thank you for the review on your recent stay at Best Western. I am pleased that you found the hotel better than expected and that it was convenient to your destination. I have passed your favorable comments along to the staff. We hope to see you again when you are in the area. A comfortable Bed, Hot shower and Free Breakfast. The Hot Breakfast left a lot to be desired. However, they had cold cereal, yogert, fruit, toast, juice, coffee, tea etc. They have an indoor pool and sauna open until 10 pm which we did not use. Coffee/Tea all day/night in the lobby. A no frills inn that is that is worth the money. Thank you for taking the time to review your recent stay with us. I am happy you found our beds comfortable and you enjoyed a decent nights sleep. We hope to see you again in the future. "Nice & New in the Poconos"
A nice clean hotel... with a friendly staff. It isn't a 5 star hotel, but it is a perfect hotel room, with a nice pool and sauna. The breakfast was good, and the whole place was neat and clean, inside and out. We always bring our dog with us, and this hotel is perfect if you bring your dog. Thank you for your review on your stay at Best Western. I am happy you enjoyed your stay with us and you found the pool and sauna enjoyable as well as our breakfast buffet. We always welcome pets and I am glad it was convenient for you to bring yours with you. We look forward to seeing you in the future. Nice room, good internet, friendly staff, terrible breakfast. In-room coffee. Stay in the back; there's less road noise. Good location. I'd eat at the Chat n Chew down 115 a mile or so. Room with 1 bed is very spacious. I stayed there this past Saturday night, along with my kids and another family. We came in from another part of town for a lantern festival. This hotel is very basic. The pool only goes up to 4 ft and the breakfast area is extremely small with the food not being great at all. If you're looking for a property with bells and whistles, this is not it. However, if you're in the area and need a place to sleep, it's quite fine for maybe a night or two. There isn't a restaurant or bar on the premises but there is a Wawa and Dunkin Donuts about 2-3 minutes (driving) away.